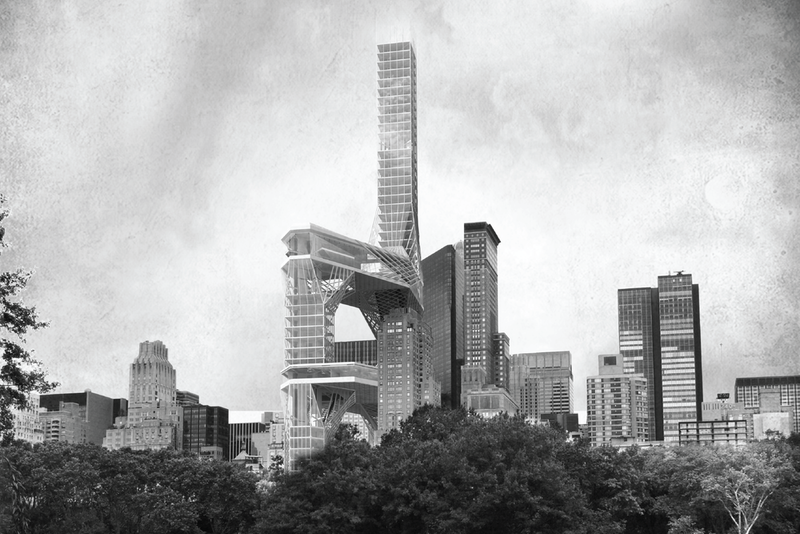 The 20th century’s notion of a skyscraper in Manhattan, a symbolic individual in the city, should be redefined due to the reinterpretation of the grid to accommodate more public amenity and facilitate the cultural contexts of Manhattan. These Days, pedestrian plazas, transportation infrastructure, and zoning resolution have given individuality to each part of the grid which used to be seemingly identical with little public provision. Especially, Mid-Manhattan shows this tendency clearly. Pedestrian activity and cultural programs of Theater District and Times Square has infiltrated into the strict grid and created Mid-Manhattan’s own public realm. In this regard, given the grid’s capacity for reinvention, how might architecture continue to adapt and response to today’s new change? 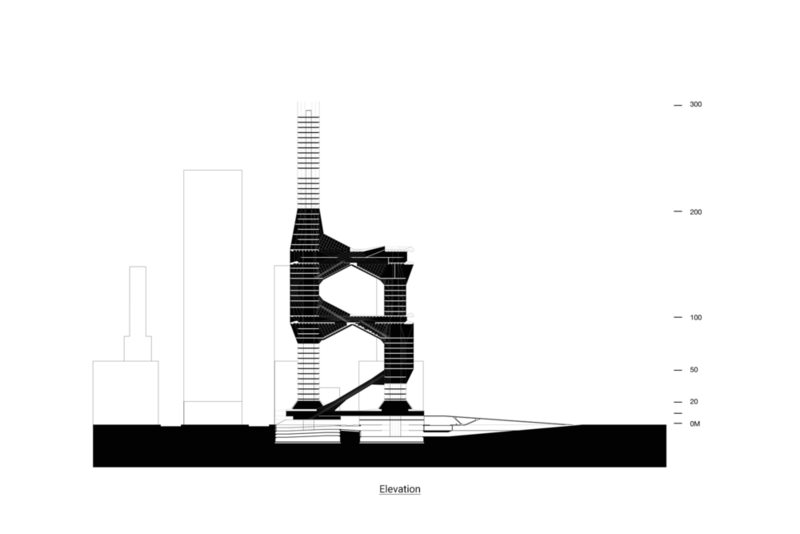 Defying the conventional typology of a skyscraper, a stack of individual programs, the project is aiming to reimagine the typology of a skyscraper to address the building’s relationship with the urban fabric and respond to the existing street life and culture. In opposition to architects’ and architectural critics’ definitions of the skyscraper in the 20th Century as having a “hostile relationship with outside” and being “an anarchic individual aloof from the city”, a skyscraper in Manhattan has evolved to accommodate more public programs for better urban environment as well as commercial reasons. 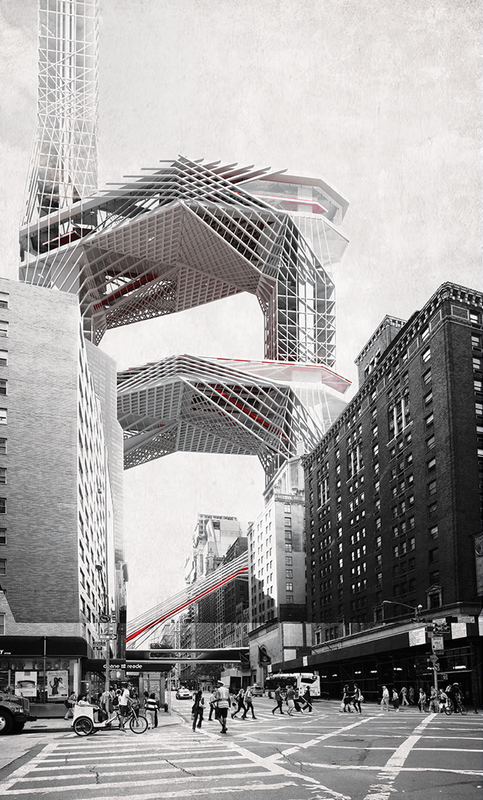 Finally, this project proposes a skyscraper as an urban connector, by rethinking circulation and structure. 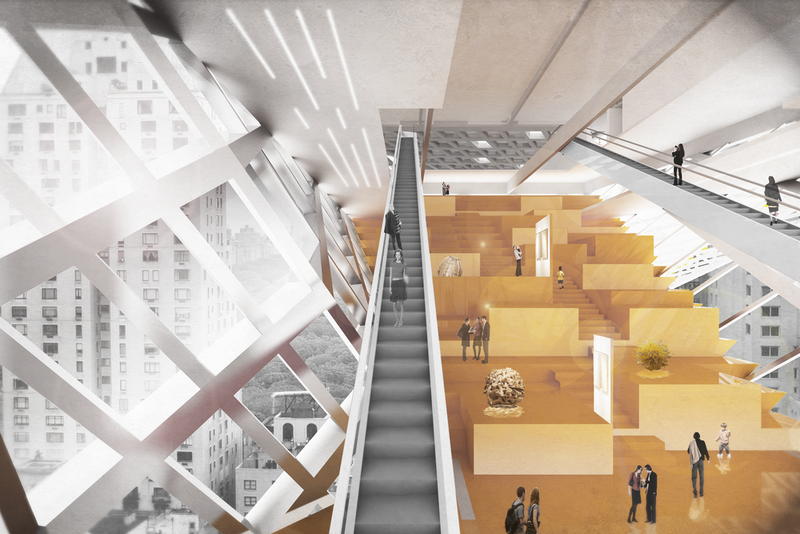 This new type of a skyscraper supports the multiple strata of public space and cultural programs, such as a theater and a museum, to extend existing urban contexts, art and performance, of Mid-Manhattan, not only at street level but into the sky above. 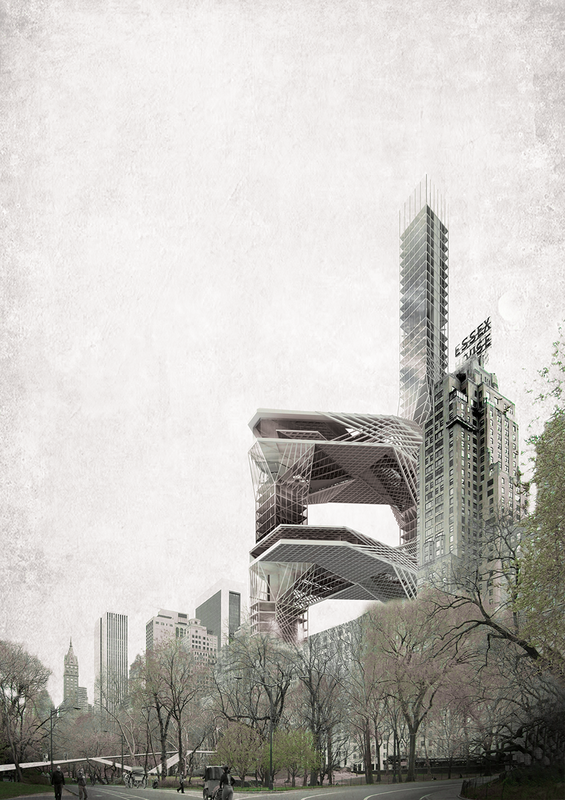 Also, as an urban-scale strategy, the project also seeks to interconnect the dense grid with vertical structures with the most dominant public realm in Manhattan, Central Park, through a 3 dimensionally manipulated building form. 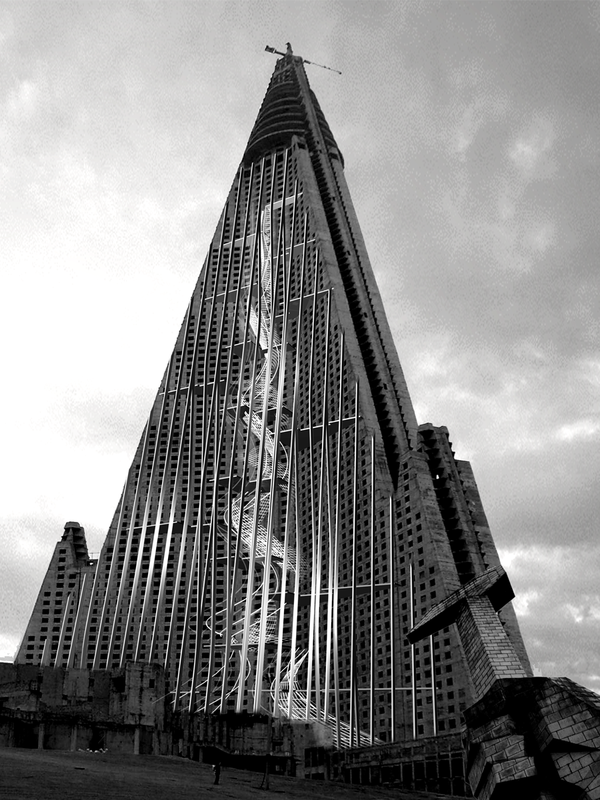 The Ryugyung Hotel for which the construction work was started to commemorate the occasion of the world youth games in 1987 still remains incomplete. It seems that the completion of this concrete pyramid of 330m is impossible due to a fatal flaw in terms of structure and an insufficient economic power of the North Korea. After all, despite that it was made for the propaganda of the North Korean communist regime, this monster has become a clear example proving that their ideology has failed. If I forecast the future, I have many doubts on whether the North Korea can maintain their regime. I have planned this project under the assumption that the North Korean government will collapse in a near future and a new democratic nation will be established (or unification with South Korea). The main concept in this project is to commemorate and remember people who sacrificed their lives for the democracy in South and North Koreas with regard to the space for people symbolizing the ideology and change it into the space where the relevant act occurs. There are two things to solve for this project. They include the solution for a structural problem and the preservation of the original building and construction of the space for accommodating a new program. For the structure, a steel frame will be reinforced in the outer part. This frame solves the structure and forms a vertical elevation. A new program is realized in this frame and this becomes a vertical street. To construct a vertical plane, not a horizontal one, I made a reference to the structure of a formicary. 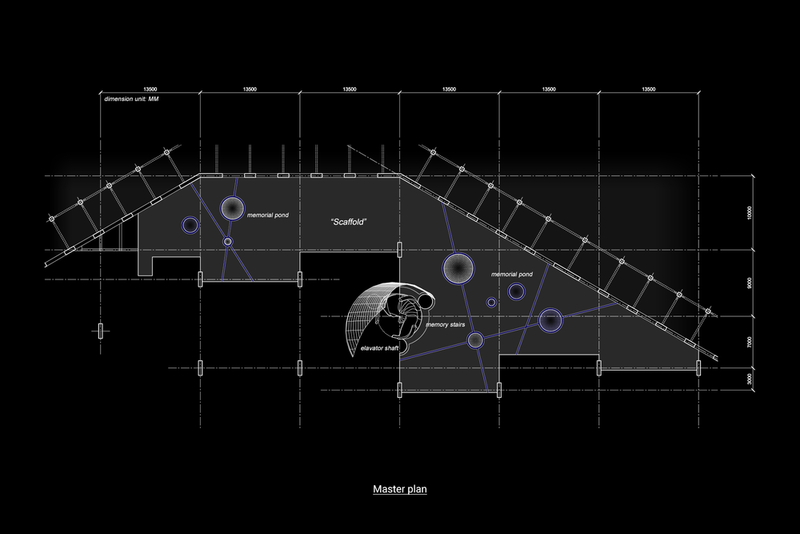 This structure consisting of descending shafts and horizontal chambers is a main design strategy in the project, i.e., connected morphology and genetics of form. In addition, the interaction of the line for structure and the one for program is another design strategy.